In England the position of the altar in a Masonic lodges can vary quite a bit from one locale to another. Some altars are positioned peculiarly close to the Worshipful Master's pedestal in the East of the lodge room. In Continental Europe, the Holy Bible or what is referred to as the Volume of the Sacred Law, may often be found on the Master's pedestal. Depending upon the amount of space available, this arrangement can justify the absence of a more centralized altar. 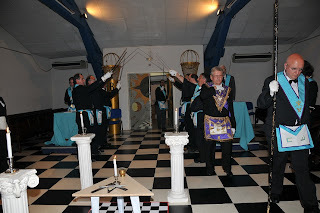 The ritual (as in the specific rite practiced) and thus the furniture of a lodge of Masons in the United States is much more rigorously standardized by the administration of the various state Grand Lodges. This is not the case elsewhere, especially not in England or Scotland where each lodge is afforded its individual autonomy to carry on its own traditions with regards to the ritual. The procedures involving movement and presentation are generally unregulated. Lodges under the Scottish Constitution are often distinguished by their own tartan pattern, and this creates a beautiful diversity of regalia. This sense of independence in Scottish lodges can be further observed in the fact that the Grand Lodge did not attempt to issue a Book of Constitution until 100 years had passed since its founding in 1736. Its first 'Constitutions' (issued in 1836) did not contain any prescription as to regalia and lodge layout and for the most part was legendary. The oldest lodges had been in existence without a Grand Lodge for some hundreds of years prior to 1736. These lodges are generally dubbed as 'Time Immemorial' lodges, and their warrants (with the exception of those chartered by Mother Lodge Kilwinning No. 0, generally consist of an old handwritten copy of the Ancient Charges. This is also the case in Ireland and England. The sovereign power is the lodge - not the Grand Lodge as such. The Lodge of Edinburgh (Mary's Chapel No. 1) have occasionally altered their procedures since their founding in 1598. They adopted what one might term to be an English mode of configuring their lodge room. It may be reasoned that their geographical proximity has something to do with this influence. It has been argued that the actual layout in a lodge room is more or less dictated by the 'geography' of the room and the convenience of the placement. There is a very old lodge that meets in a tiny room down by a harbour on the east coast of Scotland, and they do not have an altar because the room is so small. The Holy Bible is placed on a chair near to the Bible-bearer (an office which does not appear in English lodges). I would argue that the central placement of the altar is an intuitive process, but what verifiable evidence is there that it may be so? It is only conjecture, and it could be argued that the placement of the altar in the East with the Master is more conformable to the craft lodge's Catholic beginnings in the bosom of the church as guild and craft societies preserving mystery plays in imitation of the liturgy of the Latin Missal. 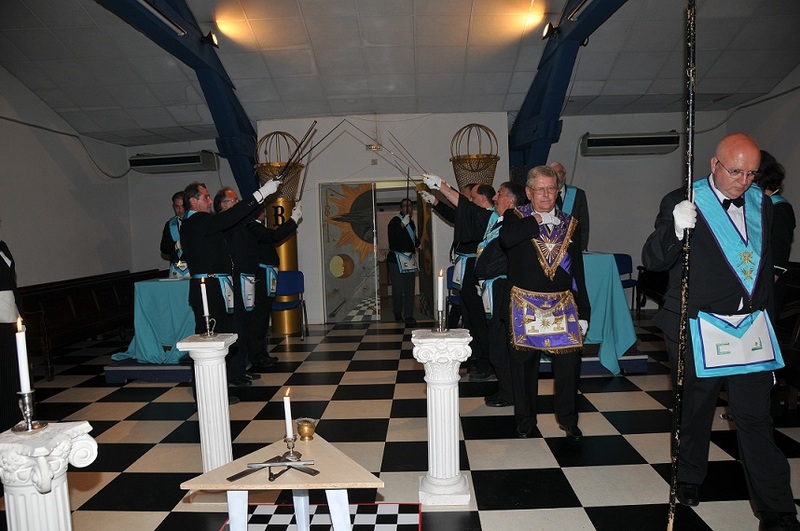 Yes, some ancient initiatory rites used centrally-located altars, but is that any reason to assume that Freemasonry employed the same underlying principles regarding lodge room layouts? None of the earliest known Scottish catechisms (from 1696 onwards) mention altars used in the ceremonies. The only references to the Holy Bible's positioning is in connection with the emblematic position the candidate assumed in holding the Holy Bible while taking his oath. Admittedly, there is nothing about the bible being placed on and supported by an altar. The designs drawn upon the floors were the proto-types of the modern day tracing boards. By way of hand drawn diagrams, they showed summaries of the teachings incorporated in the ceremonials. But, none of the early French exposures which give copious details of the ceremonies used in England in the early 1740s, mention or show altars. Can it be fathomed that the placement is due to convenience and not entirely owed to a purposely symbolic motive? One can discern a great deal of emphasis on the centrality of the altar as being intuitive. In the context of Scotland or England and the respective influence of the Roman Catholic and Anglo Catholic churches, the placement of the altar in the east in an institution born in the bosom of the church, could equally be considered to be a logical conclusion. Now, if Stuart and Jacobite supporting lodges burned their records and whatever was designed upon the floor was washed off, how are we to really know definitively that there was no meaning behind the placement of the altar. It seems to me that there is meaning to be found in every placement of every piece of furniture, every movement, and every image used within the context of Freemasonry.